Life right now. 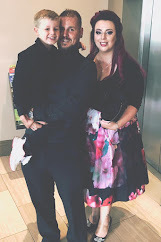 Linking up with one of my fell Irish Parenting Bloggers, Awfully Chipper, these are my favourite kind of posts! Listening to: This very minute it's Cork's Red FM on the radio, it's the only station I really listen to although I may have to reconsider now that KC is gone in the mornings. Spotify is on through my headphones at home some evenings, I rediscovered Evanescence live album a few weeks ago so that's been playing on there. Playing: Superheroes, all day everyday when the boy child is around, or good guys / bad guys: "You 2 be the good cop and catch me I'll be the bad robber" - he tells his Dad and I. Reading: I'm easing myself back into reading at the moment, I haven't done it in so long and I was an avid reader previously. I'm reading a book by a local author set in my hometown so it's not too taxing on the imagination and easy to read. There's a pile of books on my bedside locker waiting to be read. Drinking: I'm trying to cut out all those bad fizzy / sweet drinks and usually they vdon't bother me but if I feel like one I'll try and get a can of the organic stuff from the local health food shop, it's quite tasty. The elderflower one is my favourite. Wearing: Black, all black everything. It's slimming, not much but it does disguise a few lumps and bumps. Eating: I have given up crisps for Lent and anyone who knows me knows how hard that will be! I'm actually addicted to crisps like, it's kind of scary, I'd devour any packet in front of me so to ease the blow I am eating these organic, gluten free corn chips from the local health food shop. They are surprisingly tasty. Working On: A few things, being more active, making the blog more interactive and keeping on top of my to do lists, that just keep on growing. Permanently Frustrated By: The weather, will it ever stop raining?! Traffic, always forgetting to take the meat out of the freezer for dinner, ruins my meal plans! Head on over to Awfully Chipper to see a snapshot into some other blogger's lives right now.